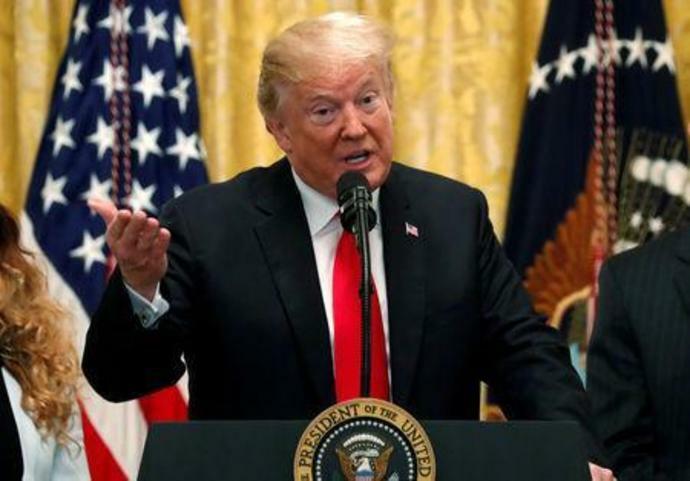 CARACAS (Reuters) - U.S. President Donald Trump said military intervention in Venezuela was "an option" as Western nations boost pressure on socialist leader Nicolas Maduro to step down, while the troubled OPEC nation's ally Russia warned against "destructive meddling." "Certainly, it's something that's on the - it's an option," Trump said, adding that Maduro requested a meeting months ago. "I've turned it down because we're very far along in the process," he said in a CBS "Face the Nation" interview. "So, I think the process is playing out." "The international community's goal should be to help (Venezuela), without destructive meddling from beyond its borders," Alexander Shchetinin, head of the Latin America department at Russia's Foreign Ministry, told Interfax. Maduro on state television promised peace for the country without specifically responding to Trump. Tens of thousands of people thronged the streets of various Venezuelan cities on Saturday to protest Maduro's government. "In Venezuela, there will be peace, and we will guarantee this peace with the civil military union," he said in the company of khaki and black-clad soldiers who were earlier shown carrying guns and jumping from helicopters into the sea. Venezuela's ambassador to Iraq, Jonathan Velasco, became the latest official to recognize opposition leader Guaido this weekend. Air Force General Francisco Yanez in a video also called on members of the military to defect but there were no signs the armed forces were turning against Maduro.